Police in Coral Springs, Florida, defend a police officer's actions after being filmed as he beat a 14-year-old girl while being knocked to the ground during a detention. The police department of Coral Springs has issued a statement stating that the mobile video does not tell the full story. "The actions of the policeman were 100 percent within politics, legal and not over the top," Chief Brad McKeone told reporters, CBS Miami reports. The department said officials were harassed patrons on Thursday for being the teenager in the Coral Springs Mall, and one mother claimed one of the teens had knocked her 5-year-old child to the ground. The police banished the group from the mall at the request of their security team, but the police said they would return at some point. After one person was arrested, the police said the girl in the video was trying to "incite" other young people. "Officers tried to detain them, and at that time, she began to fight and resist the arrest, and because of her stature and aggressive behavior, officials brought her to the ground and tried to make her fist solve, "said the department in a statement. The teenager's mother, Jessica Dennis, said the officer had "completely gone overboard." "Her hands are nailed down, he fishes her whole body with her shorts, there was just too much going on and she was clearly not" aggressive, "Dennis said in a press conference, reports CBS Miami. The family lawyer "Meeghan Moldof, just talked about the moments captured on video and said she would not comment on the criminal aspect of the case." 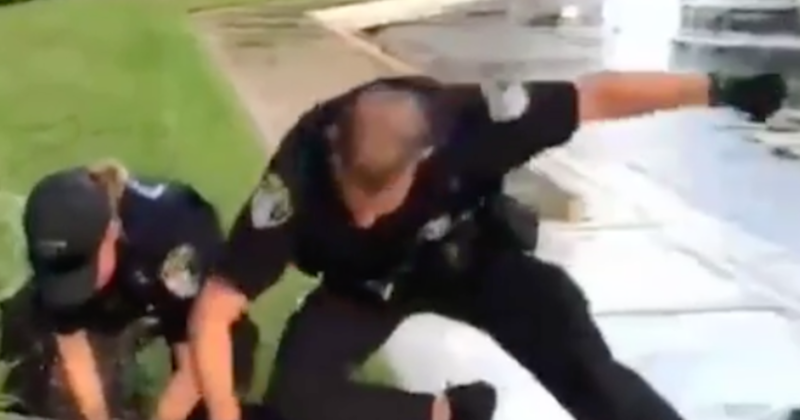 But to say that the cop was entitled to beat her continuously while he was kneeling on her back and having her hands under her belly, the video speaks for itself. " Police said, however, that they are not investigating the actions of the policeman. That could change if the mother decides to file a formal complaint CBS Miami reports.